If you aren't familiar with Lanai Blo, it was developed by Katie Jane Golden, who grew up in a family involved in the hair business, which meant that she had a natural interest in it. 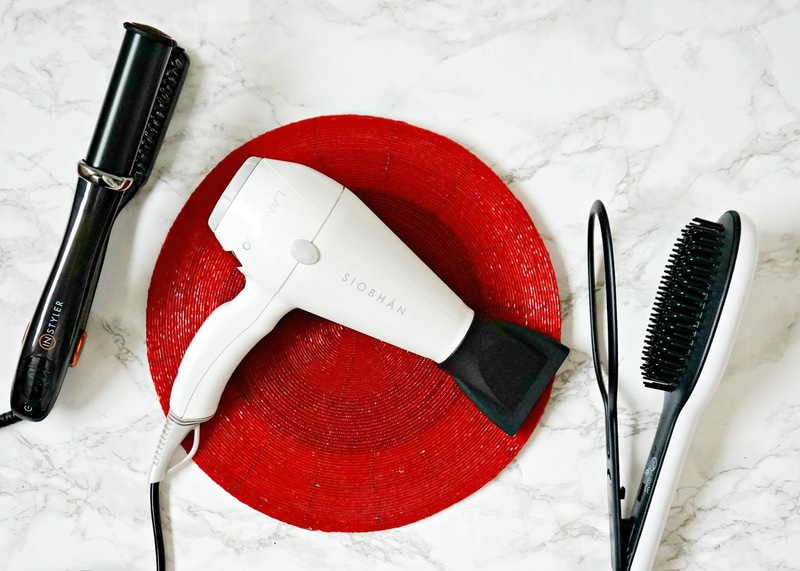 When she had her first child, like all mothers, she had less time on her hands but still wanted her hair to look good so in 2016, she launched the Lanai Blo hairdryer in Ireland and, more recently in the UK, which dries hair much faster than other hairdryers. It comes in three colours: Black, White and Pink - something for all tastes and it can be personalised if you wish. Because of my illness, drying my hair is a real chore as it's very time consuming and energy-sapping. I have quite fine hair, but lots of it and it is below shoulder length, also frizzy and naturally has a kink in it, so I can't really just leave it to dry naturally or it looks awful! Plus, it's just too cold to do that these days! Blowdrying my hair previously took me around 35-40 minutes but with the Lanai Blo, my hair is completely dry in 10 minutes. It has been a revelation for me! The Lanai Blo has a really long cord, which I love, and two different sized nozzles for precise heat and air flow. It uses Ionic Technology to prevent static and it also has a cold shot, which I use to 'set' my hair as a final step. The 2400W means that it is super fast, as I have already mentioned, but what I personally really love about it is that it is lightweight so I don't get the dreaded arm ache when drying my hair and it leaves my hair looking very shiny! My husband even asked if I had been to the salon when I first used it and my Mam said that my hair looked really glossy! Overall, I couldn't be happier and it is most definitely the best hairdryer I have used. The fact that it can be personalised is the cherry on top! Katie Jane is also the C.E.O. of Instyler (as well as a few other haircare companies) and I was also kindly sent two of their products. The first is the InStyler MAX 2-Way Rotating Iron, which is described as being able to straighten and curl the hair. I personally don't find it to be the best at straightening my unruly hair but I absolutely love it for creating waves. Like the hairdryer, it uses Ionic Technology to tame frizz. It has 4 heat settings, a long cord and heats up in 30 seconds - all very convenient features. Because it rotates in 2 directions, it makes it easy to do both sides of your head without the need for acrobatics! I wrap my hair around the barrel, directing away from my face and create loose waves, which I set with Ouai Texturising Hair Spray and I am good to go! It is so much easier to use than other waving wands I have used in the past - this will be getting a lot of use over the festive season! The second styling tool that I was sent is the InStyler Glossie, which is unlike anything I have used before! It is a lightweight, ceramic styling brush with a long cord and 4 heat settings. When I am wearing my hair straight, I run this over sections of my hair and it instantly tames any frizz and makes my hair look so healthy and glossy, as the name suggests! I've never known a tool to make such a noticeable and instantaneous difference to my hair before! If you have frizzy or brittle hair, you need this tool in your life! Overall, I absolutely love all three products. The fact that I can have my hair bone dry in less than 10 minutes is a minor miracle in my eyes, plus the styling tools are so quick and easy to use. My hair always looks like it has been professionally done when I use these products so I could not be happier with them! If you wish to purchase them, they are available here and here and also in Argos and Boots. Do you like personalised products? How long does it take you to dry and style your hair? I'd love to hear! All products are bought by me, unless otherwise stated. All three of these products were kindly sent to me. Opinion is always my own.